An adsorption-based array sensor coated with different molecularly imprinted polymers (MIPs) was fabricated to effectively and simultaneously detect specific volatile organic compounds (VOCs) such as benzene and isopropyl methyl ketone (IMK). The synthesized MIPs showed remarkable recognition properties such as sensitivity and selectivity for their target molecule. 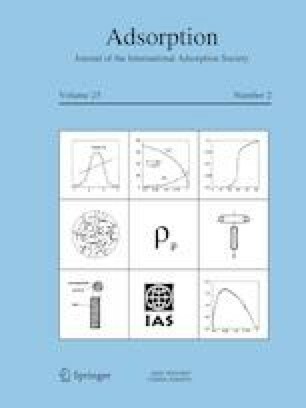 Furthermore a detection method for array sensors was formulated based on several adsorption equilibrium isotherm models to determine individual partial pressures in the VOCs mixture from the overall adsorption capacities on array sensor elements. The results indicated that the detection method provided relatively good predictions for binary target species within the experimental error. Min-Jin Hwang and Wang-Geun Shim have contributed equally to this work. The online version of this article ( https://doi.org/10.1007/s10450-019-00074-w) contains supplementary material, which is available to authorized users. This research was financially supported by national research foundation (NRF) of Korea Korean government (Grant No. 2017R1C1B5076576).